"As a dentist, I have the privilege to make a difference in a person's life. Whether it's improving their smile or treating their pain, it's rewarding to know you have improved their quality of life." Dr. Welty is a member of the American Dental Association, Academy of General Dentistry, Illinois State Dental Society and QCASO Orthodontic Study Club. 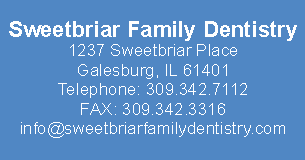 Dr. Welty currently resides in Galesburg, IL with his wife Debbie. He is involved in the Bethel Baptist Church and the Galesburg Community Foundation. In his free time, Dr. Welty enjoys baseball, mountain biking, reading and music.